Lilies are wildly popular flowering plants that come in a huge range of variety and color. They come as small as dwarf plants that function as ground cover, but other varieties can be found that reach as tall as 8 feet. These are called tree lilies, and their spectacular height makes them well worth growing. Despite being so large, tree lilies in containers perform well, as long as they have enough space. Keep reading to learn more about how to grow tree lilies in containers and caring for potted tree lilies. The key to growing tree lilies in pots is giving them enough room. Lily bulbs can actually be placed relatively close together, with a spacing of about 2 inches between bulbs. Especially in containers, this gives the plants a fuller, denser look, and being packed so tightly doesn’t affect them in a negative way. It’s the depth of the container that you have to worry about. Get a container that’s at least 10 inches deep, preferably more. Keep in mind that you not only need to provide space for the roots, you also need a big heavy pot to balance out all that height. Plant your tree lily bulbs in autumn or spring. Cover them with compost so that just the tips of the shoots are poking out. Following their planting, caring for potted tree lilies is relatively easy. Put your container in a place that receives full sun, and water and fertilize well. You can overwinter your lilies in cold climates by placing the containers in a sheltered but unheated shed or basement. 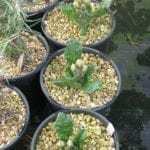 Repot the bulbs to a bigger container each autumn, after the flowers have faded. Knowing how to grow tree lilies in containers is that simple. So if you’re low on typical garden space, you can still enjoy these tall, statuesque plants by growing your tree lilies in pots.